Imagine the excitement when you first view the blow of a whale spouting. The Bay of Fundy is teeming with wildlife and is a critical habitat for many species of whales and dolphins. Home to over eight species of whales and a whale population that can exceed 300 at any one time, the Bay of Fundy is a fantastic destination for whale watchers. Bay of Fundy whale watching tours are run out of St. Andrews, Grand Manan and Campobello Island in New Brunswick and out of various harbours near Digby, Nova Scotia. Commonly sighted aboard these whale watching tours are the Humpback whale, Minke whales, and Finback whales. The Bay of Fundy also has a Nursery for the Endangered North Atlantic Right Whale. Other whales occasionally sighted in the Bay of Fundy include the Sei Whale and Pilot Whale. A rare sighting would include the Blue Whale, Sperm whale, Killer whale, and Beluga whale. For more information about the whales, visit our Bay of Fundy Whales section. If you want to see whales and dolphins during your trip it’s important to note that the Bay of Fundy whale watching season runs from June to October inclusive. The best month to see whales and other wildlife is August. The whales and dolphins of the Bay of Fundy are graceful and spectacular and sure to be a highlight of your vacation! 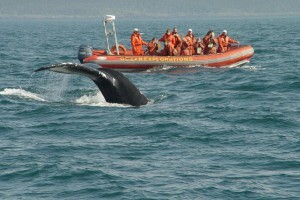 A whale watching tour experience can differ depending on the type of vessel used. There are four main types of vessels used: converted fishing boats, catamarans, motor/sailing vessels and zodiacs. A zodiac will give you a unique perspective by putting you at the same level as the water surface, however the other vessels provide a much smoother ride and provide shelter from the cool Bay breezes and other weather elements. Whale watching companies communicate with each other while on the water and most of time all boats are in the same area and see a similar amount of whales. Selecting a whale watching tour ultimately depends on your personal preference, but make sure you keep an eye on the extras being offered by some companies. Such added value items can include a touch aquarium with starfish, sea urchins, crabs, etc. and/or some complimentary snacks on board. For example, the Jolly Breeze Tall Ship of St. Andrews is the only vessel to provide a heated cabin, blankets and rain jackets for all. They are also the only vessel that has a licensed bar for the adults and provides pirate costumes and face painting for the kids. They’ll even hand out honorary captain’s certificates for steering the vessel and hauling up a sail. There are many whale watching eco tours and island tours around the Bay of Fundy including departures from St. Andrews, Deer Island, Campobello Island, and Grand Manan in New Brunswick, and Digby Neck, Long and Brier Island in Nova Scotia. All tours provide experienced guides to answer your questions. Even in the summer heat the waters of the Bay of Fundy can be as cold as 2 degrees Celsius (36 degrees Fahrenheit) which can result in cool ocean breezes. How cold the whale watching experience can be varies on what type of vessel is used for the tour, but you should be prepared with extra clothing as it is cooler on the water. Bring a camera and binoculars if you have them. Reservations are often required as the whale watching tours fill up quickly. The whale watching tours follow the Bay of Fundy Marine Tour Operators Code of Ethics which includes no chasing, harassing or herding the whales. This is to ensure that the whales are not disturbed from their natural routine or injured. Occasionally a whale may choose to come within 25 feet of the whale watching tours vessel and provide a truly memorable experience. Although extremely rare, at times a group of Right Whales might form a SAG (surface active group), averaging 6-15 whales rolling and courting each other, the water churning, snouts, flippers and tails displayed. This impressive sight can be seen in the video to the right. Can you please provide links to the whale watching companies? In particular having difficulty finding ones you reference in Campobello and/or Deer Islands. Hi there – While doing a review of your site I have noticed some information that may be considered misleading. You state, “Whale watching companies communicate with each other while on the water and most of time all boats are in the same area and see a similar amount of whales”. From St. Andrews this is more often not the case. The majority of large whale sightings from St. Andrews take place in the vicinity of the Wolves Islands and beyond. This area is approximately 16+nm from St. Andrews. Vessels that do not have the range cannot access this area. The rigid hull inflatable boats and catamaran are the only vessels that regularly visit this area due to their speed. These vessels invest the time and fuel to show their passengers the type of whales that everyone markets. We have been doing this for 24 years and can state that the only way to be consistent from St. Andrews is being able to “go the distance”. I’d also take exception to the claim that the Jolly Breeze (the only company of the many whale watch companies you link too) is the only with a heated cabin. Quoddy Link Marine provides a heated cabin and blankets. We don’t provide rain gear as we can keep all passengers under cover. You may also wish to advise visitors to your site that Quoddy Link Marine’s catamaran is the only vessel that is wheel chair accessible. Last season, Quoddy Link Marine had its best season (in 24) for the number of recorded large whales (humpbacks and finbacks) the majority, more than 85% were more than 16+ nm (30+ km) from St. Andrews. That meant about 50% of the folks who went whale watching from St. Andrews missed the opportunity to view large whales because they chose the wrong vessel – a result of the myth that “all vessels go to the same area and see the same number of whales”. Certainly when the weather offshore is poor, all the vessels are inshore trying to watch a minke(s) and occasional finwhale(s). The rigid hull inflatables and catamaran do not offer pirate experiences, but they do offer a much better opportunity for large whale experiences from St. Andrews – that is a fact that can’t be ignored. We will be travel to Bay of Fundy in July of this year. I would like to book a whale watching trip. Where do I go to book a trip???? We be in n.b late September, would there be any whales to see .and what is the cost for seniors? we will be visiting the bay of Fundy mid September. Will this be too late in the season to spot whales ? We would like to do a whale tour in late April. Are there tours available during that time frame? Um…..can you see whales from the shore? Sometimes, but don’t count on it. You’ll be able to get a much better and closer look from a boat. Hi, I’d like to go whale watching with my husband and 2 boys but am unsure how to book the trip and how much it will cost. is end of july a good time to see whales? 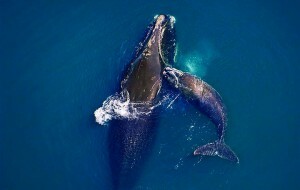 We are heading our to new Brunswick at the end of July, is this a good time to see whales??? we will be cruising into st john on august 26th of this year. where is the best place to go for a whale watching tour that is not going to take up all of our time while docked? We will be visiting in the Fall. Do you provide brochures? How cold is it around Oct. 1st? Highs are typically around 10 to 15 degrees celsius at that time of year. The lows are roughly around 0 (there could be some light frost during the nights). You can get free brochures through either New Brunswick Tourism or Nova Scotia Tourism. I also highly recommend the Atlantic Canada travel guide from Lonely Planet (you can find it somewhere in the right sidebar on this page). I am coming in October 7th. Can you tell me if there are any tour companies going out on this day? We’re going to the Bay of Fundy and Prospect Bay, NS. Where in these areas would there be a good place to go whale watching? You can definitely find whale watching tours in both Halifax and Lunenburg. Neither one would go to the Bay of Fundy, but there’s plenty of whales to be seen off the east coast of Nova Scotia as well. I am honestly not sure. I would recommend you contact NB Parks directly (contact information on https://parcsnbparks.ca/ReservationService.aspx). If you do find out there’s a deal like that, I’d be very interested to hear back. We are in Prince Edward Island, where would the closest Whale watching tours be from here? In St. Andrews, NB. See https://www.bayoffundy.com/places/area/st-andrews/type/whale-watching/. Digby, NS would also be a good choice, but is a little further away. The rates vary, but you should expect to pay around $50 or $55 for an adult and maybe around $35 for youth. Some companies will offer family discounts as well. The whales reside in the southern part of the bay, so unfortunately there aren’t any whale watching companies near Amherst. 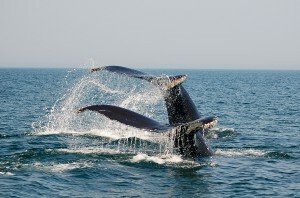 The closest whale watching tours for you would be out of St. Andrews, NB (about a 4 hour trip) or Digby, NS (4.5 hours). Could you please notify me by email regarding Whale Watching. I am in Truro, NS and would like to do this today, August 7 if that is possible. Please give me a street address so that I may find your location. We don’t actually offer whale watching tours ourselves, nor are there any good whale watching opportunities near Truro. You’ll have to drive south towards Brier Island, NS or to Saint Andrews or Grand Manan in New Brunswick.